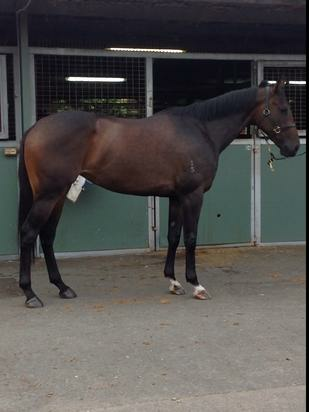 UNENCUMBERED (AUS) (Bay or Brown 2011-Stud 2014). 5 wins at 2, A$1,908,850, BRC BJ McLachlan S., Gr.3, GCTC Magic Millions 2YO Classic, RL, Wyong Magic Millions 2YO Classic, RL, ATC Ascend Sale Trophies 2YO P., Sharp 2YO P., 2d ATC Todman S., Gr.2. Out of SW Blizzardly (AJC Keith Mackay H., L). Related to SW Rembetica and SW Sober Dancer. His oldest progeny are yearlings. Two Hills (f. by Hillman). 7 wins-2 at 2-to 1400m, A$363,613, VRC Hyperno 2YO H., Secondbite P.H., MVRC Dr Sheahan P.H., MRC Ricoh H., Shankhill Lass H., 2d VRC Grand Archway 2YO H., MRC Cecil Godby 2YO H., BWS H., MVRC Eskander's Betstar 2YO H., MRC Bazzani Scully Brand Lawyers H., Catanach's Jewellers H., Adelina H., Snitzel at Arrowfield Stud H., MVRC IMG Sports Technology H., 3d MRC Bill Collins H., Pamela Hutterer H., Over H., No Fuss Solutions P., Bendigo JC Catanach's Jewellers Gold Bracelet, VRC Warren Lee & Kenneth Norton H., MRC Browns Sawdust & Shavings H., Echuca Cup. Purple Storm (f. by Churchill Downs). 2 wins at 1200m, MVRC Cleanaway H., 3d MRC Swift Signs H., 4th MVRC William Crockett S., L.
Sergeant Hightower (g. by Churchill Downs). 5 wins at 1000m, 1200m, A$111,625, to 2016-17, 3d MRC (Mornington) Nepean Waste H.
Marshal Blucher (g. by King of Prussia). 7 wins to 1300m, A$75,123 in Aust. Hill of Faith (g. by Keep the Faith). 4 wins to 1100m in Aust. Sumba (f. by Dash for Cash). Winner at 1200m in Korea. Burst Away. 2 wins at 1050m, 1200m in 2015-16, SAJC Zebedee at Cornerstone P., Hughes Chauffeured Limousines H., 2d SAJC Guardian Insurance H., Exelsuper H., 3d SAJC Ubet H.
Uncle Buck. 2 wins at 2050m, 2450m to 2015-16, 2d MVRC Hume Collision Centre H., 3d MRC Crown Lager H., MVRC Johnnie Walker H., SAJC Master Builders H.
Belworth. 2 wins at 1250m, 1400m in 2015-16 in Aust. Miss Prissy. 3 wins to 1300m, MRC June H., 2d MRC Kind Link H. Producer. Reprisal - Mighty Kincsem (Mal.) (Marauding). 3 wins at 1200m in Aust. and Malaysia, Selangor TC Class 1 H., 2d Singapore TC Class 1 H., 3d Selangor Gold Cup, L, Singapore TC Class 1 H., AJC Wiggle H.
Missvonn (Teofilo). 3 wins from 1200m to 1900m, A$181,085, ATC Hyland Race Colours H., 2d ATC Adrian Knox S., Gr.3. Worth a Ransom (Red Ransom). 4 wins-1 at 2-from 1200m to 1600m, A$330,460, VRC VOBIS Gold Reef S., Wangaratta TC RJ Hoysted Memorial Gold Eldorado, 2d MRC Manfred S., Gr.3, 3d MRC VOBIS Gold Sprint. Graphic. 13 wins to 1550m, A$135,285, AJC Sunnybrook Travelodge H., Sedgwick Abrahams H., ES Playfair Welter H., Birdcage Welter H., STC Truscott's Toyota Welter H., Soul Pattinson Trade Show Welter H., Truscotts H., 2d STC Strathfield Welter H., Willoughby Legions Welter H., 3d AJC Birdcage Welter H., Jack Jarvis Welter H., 4th AJC Liverpool City Cup, Gr.3. Worth While Money. 4 wins to 1200m, AJC Wattle Grove H.
ARTIST MAN (Boucher). 13 wins from 1400m to 2100m, A$171,250, WATC Kaiser Stuhl S., L, 2d Queensland Derby, Gr.1, WATC Australian Derby, Gr.1, QTC Grand Prix S., Gr.2. WORTH (Luskin Star). 4 wins. See above. WINTER BURST (Western Winter). 5 wins-1 at 2-at 1200m, 1400m, R397,500, Kenilworth Prix du Cap, Gr.3, 2d Kenilworth Olympic Duel S., L-twice, 3d Kenilworth Fillies Championship S., Gr.2, Diana S., Gr.3. Producer. ECLAIR CHOICE (California Dane). 6 wins-1 at 2-to 1200m, A$498,080, S$11,025, to 2015-16, VRC Tab.com.au S., Gr.2, MRC Caulfield Sprint H., Gr.2, SAJC Redelva S., L, Schweppes 2YO H., MVRC 1print H., 2d Bendigo Guineas, L, 3d MRC Victoria H., Gr.3, SAJC WH Wylie H., L.
ZOUTENANT (Zizou). 2 wins-1 at 2-at 1000m, 1100m, A$258,000, to 2015-16, Wyong Magic Millions 2YO Classic, L, 2d ATC Roman Consul S., Gr.2. Crab Apple (Boucher). Winner at 2, VATC Matinee S., 2d VATC St George S., Gr.2, 3d VRC Moomba P., Gr.3. Producer. RESTIVE (Zeditave). 18 wins-1 at 2-to 1300m, A$301,655, WATC RS Crawford S., L, 2d WATC Birthday S., L.
HISTORIAN (Choisir). 5 wins from 1400m to 2000m, NZ$757,550, ARC Zabeel Classic, Gr.1, WRC Thorndon Mile, Gr.1, Hawkes Bay Tumu ITM Spring Sprint H., Gr.3, ARC Auckland Co-Op Taxis H., 2d New Zealand Derby, Gr.1, ARC New Zealand S., Gr.1, Novotel Mile H., Cambridge Stud Yearling Draft 3YO H., 3d Waikato Guineas, Gr.3, 4th Avondale Guineas, Gr.2. RICH UNICORN (Danehill Dancer). 6 wins-1 at 2-to 1200m, A$20,200, HK$5,916,750 in Aust. and HK, HKJC Premier Bowl H., HK-2, 3d HKJC Sha Tin Vase, HK-3. EXCEPTIONALLY (Ekraar). 4 wins from 1600m to 2800m, A$511,677, VRC St Leger, L, 2d MRC Sandown Classic, Gr.2-twice. SUPERFLY (Rock of Gibraltar). Winner at 2, A$122,200, AJC Widden S., L, 3d AJC Gimcrack S., L. Producer. LONGCHAMP (Tavistock). 6 wins-1 at 2-to 1400m, NZ$152,120, to 2015-16, Taranaki RC Opunake Cup, L, 3d Hawke's Bay Guineas, Gr.2. VICTORY PRINCE (Imperial Prince). 2 wins at 2, AJC Sires' Produce S., Gr.1, Liverpool Festival H., 2d AJC Champagne S., Gr.1, Newcastle JC Penfolds Classic S., Gr.3, 3d STC Pago Pago S., Gr.3. Sire. PSYCHIC MICK (Shinzig). 5 wins-3 at 2-to 1200m, A$197,470, MRC Vain S., L, SAJC Distinctive Homes 2YO P.
MISS PAVLOVA (Blevic). 4 wins from 1450m to 2600m, A$181,203, SAJC Lord Reims S., Gr.3, MRC Allan Wicks H., SAJC Format Homes H., AV Jennings H. Producer. BUSH PADRE (Redding). 12 wins from 1400m to 2200m, A$1,041,200, BTC Doomben Cup, Gr.1, GCTC AD Hollindale S., Gr.2, MRC Easter Cup, Gr.3, SAJC Veuve Clicquot S., L, Cranbourne Cup, L, Geelong RC Derby Trial S., L, MRC Chancellor's P., MVRC Carlton Draught H., QTC Sunset Sue Welter H., 2d South Australian Derby, Gr.1, VRC Chester Manifold S., L, 4th QTC PJ O'Shea S., Gr.2.